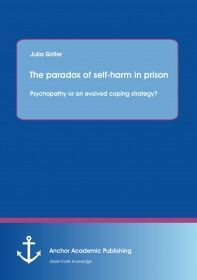 The paradox of self-harm in prison: psychopathy or an evolved coping strategy? Deliberate self-harm (DSH) refers to intentionally self-inflicted injuries, and is mainly explained by abuse or neglect, severe psychopathy or at least a trait of a mental disorder. Most functions of DSH serve intrapersonal motives but interpersonal reasons are also found. These range from seeking for attention, pity and sympathy, to benefits like care, help or avoidance of unpleasant tasks or persons. To the latter belongs the deterrence of assaulters, a benefit, especially desirable for prisoners due to the hostile and brutal environment of prisons. This book scrutinizes two hypotheses of avoidance of attacks in prisons by the use of episodes of DSH as costly signals building upon the signaling theory developed in economics and biology. The first hypothesis is that DSH is an honest signal of fearlessness intended to repel other inmates from attacking. The second deals with the avoidance of assaulters by signaling madness via DSH to achieve relocation into an asylum. The underlying motive in this case is the need of protection, and thus, DSH serves as a cry for help to prison authorities. All necessary requirements of both hypotheses are examined, provided with evidence from existing research and analyzed with the help of mathematical models.